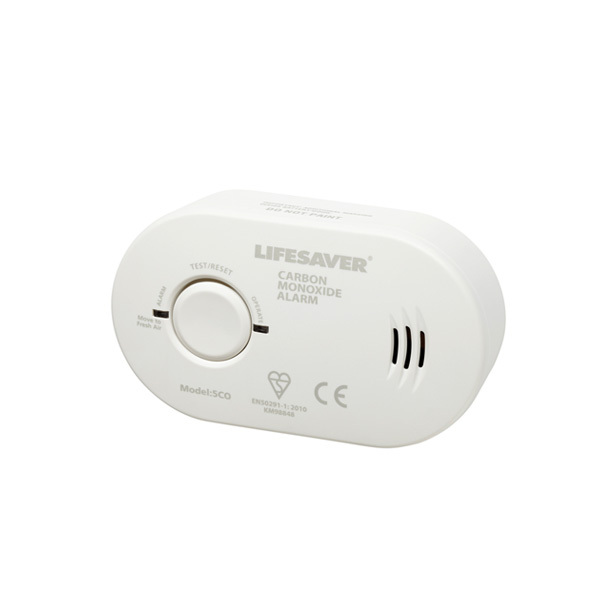 The Kidde Lifesaver Carbon Monoxide Alarm continuously monitors for the presence of deadly Carbon Monoxide (CO) in the home, providing a constant protection against the effects of this deadly gas. This carbon monoxide alarm features two LED’s – The red LED illuminates when the alarm has detected CO in the atmosphere and the green LED confirms that DC power is present. The alarm can either be installed on a wall or just placed on a tabletop or shelf for added convenience. It is also ideal for use when on holiday and in rented accommodation. The Lifesaver 5CO features a 7 year sensor life with an end of life warning to replace the unit after seven years protection. Regular inspection and maintenance of appliances, vents, flues and chimneys are the best ways to protect you and your family from the danger of carbon monoxide, but for added protection you should install one or more carbon monoxide alarms in your home. Some registered gas installers will supply and fit carbon monoxide alarms in addition to servicing your appliances. If fitting the alarm yourself, follow the manufacturer’s instructions. More than one alarm may be required to offer full protection. It is recommended that you have an alarm in every room that has a fuel-burning appliance and one within 5 m (16 ft) of every bedroom. Test your alarm regularly and replace it when it reaches the end of its life. Remember, a carbon monoxide alarm is not a substitute for a smoke alarm.